Robin Williams Had Four More Finished Film Roles - What Are They? We're still reeling from the loss of veteran actor and comedian Robin Williams as millions from around the world keep pouring their love out for the actor across all channels of social media. And now that this legend is gone, many are wondering about the work that he had already done, and when we'll get to see his final performances. Williams had several projects which he was already finished shooting and they are Merry Friggin' Christmas, Night at the Museum: Secret of the Tomb, Absolutely Anything and Boulevard. If you're not familiar with any of those projects, you can find out more below. Read on! Boyd Mitchler (Joel McHale) and his family must spend Christmas with his estranged family of misfits. Upon realizing that he left all his son's gifts at home, he hits the road with his dad (Robin Williams) in an attempt to make the 8-hour round trip before sunrise. Tristram Shapeero, who has directed multiple episodes of TV series like "Happy Endings," "Community," "Parks and Recreation," and "New Girl," makes his feature directorial debut on this film written by Wreck-It Ralph screenwriter Phil Johnston. The film also stars Lauren Graham, Tim Heidecker, Pierce Gagnon, Wendi McLonden-Covey, Ryan Lee, Amara Miller, Bebe Wood and more. What starts as an aimless drive down an unfamiliar street turns into a life-altering decision for the curious Nolan Mack (Robin Williams), a devoted husband and dutiful bank employee who begins to confront his own secrets. For many years, Nolan and his wife Joy (Kathy Baker) have embraced their marriage as a convenient distraction from facing reality. When he meets a troubled young man named Leo (Roberto Aguire) on his drive home, Nolan finds himself breaking from the confines of his old life. The film comes from director Dito Montiel (A Guide to Recognizing Your Saints), so we're not sure what to expect, but having Williams and Odenirk take on drama together is something that makes this film extremely appealing. However, the film currently has no release date set, so stay tuned for more info. Finally, Williams' last film will end on a funny note, and also feature one of his most sterling comedic features: his voice. After bringing life to Genie in Aladdin and voicing other animated characters, Williams lent his voice to Dennis the Dog in the live-action sci-fi comedy Absolutely Anything, a film that also features the voices of nearly all of the members of Monty Python. The film follows a disillusioned school teacher (Simon Pegg) who suddenly finds he has the ability to do anything he wants, a challenge bestowed upon him by a group of power-crazed aliens (voiced by John Cleese, Terry Gilliam, Terry Jones and Michael Palin watching him from space. The dog ends up being able to talk due to Pegg's new powers, and that's where the genius of Williams will come into play. Much like waiting for the final performances of Philip Seymour Hoffman this year, it's thoroughly depressing that we have to look forward to what will be the final performances of such a gifted actor and comedian. And while there hasn't been an official statement on the matter, you can probably safely assume that the recently reported development of a sequel to Mrs. Doubtfire, one of Williams' biggest and most favorite comedy hits, will probably be stopped. That just wouldn't be the same without Williams. This is a loss that will be echoing through the masses for awhile, and we still can't believe Robin Williams is gone, but we look forward to these final performances he gave us. The beauty of film is that when someone dies they leave a legacy that will live on forever. Now there is a reason to go see NIGHT IN THE MUSEUM 3. 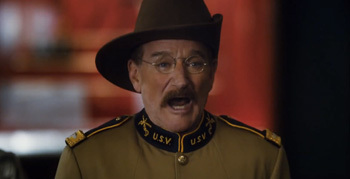 He always looked like he was having a blast playing Teddy Roosevelt.